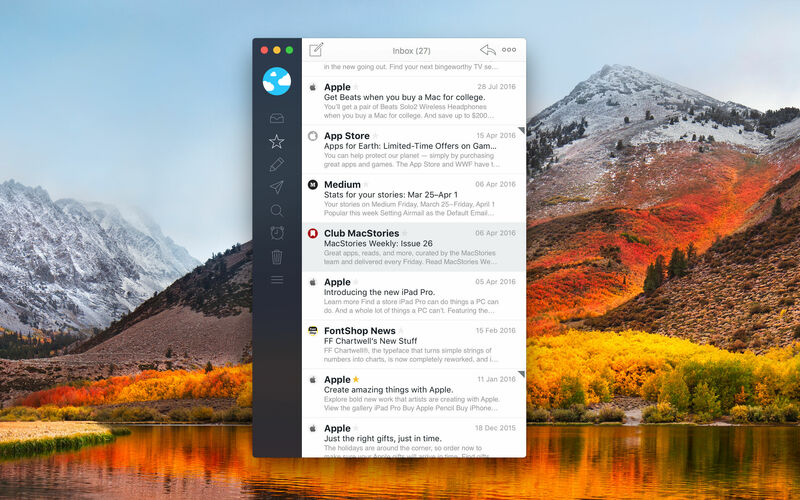 Airmail is the 2017 Apple Design Award-winning email client from Bloop for the Mac and iOS that marries elegant design with rich, customizable features that tame your inbox. Everyone approaches email a little differently. For some people, their inbox is a sort of task manager. For others, keeping their inbox empty and messages neatly organized into folders is paramount. No matter how you manage your email accounts, Airmail has you covered. Airmail is highly customizable while maintaining a clean, intuitive interface that makes it a pleasure to use. The app supports all major email technologies, including Gmail, iCloud, Exchange, IMAP, and POP3. On macOS, Airmail also incorporates the latest operating system features like the Touch Bar. With Airmail, you can manage one or several email accounts. With multiple accounts, it’s just as easy to review messages from every account in a unified inbox as it is to dive into just one account. Airmail also features rich customization like the ability to send messages later, snooze messages, and create smart folders and rules. Actions let you send messages to other apps you use like task managers and your calendar or create a PDF from a message. On the Mac, Airmail supports the Touch Bar too. Best of all, you only need to set up Airmail once because your settings sync via iCloud to all your Macs and iOS devices. Airmail is actively developed across all of Apple’s platforms. Most recently, Airmail has added a redesigned and improved search system, user templates that sync across all your devices, and Spotlight search, so you can find messages even when you’re not in Airmail. The app’s broad feature set and customization all add up to make Airmail the perfect choice for email power users. Download Airmail for the Mac today from the Mac App Store and for the iPhone, iPad, and Apple Watch from the App Store. Our thanks to Airmail for sponsoring MacStories this week.